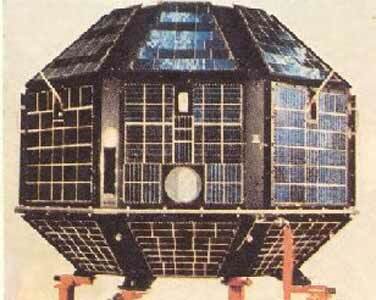 The Aryabhata 1 spacecraft, named after the famous Indian astronomer, was India's first satellite and was completely designed and fabricated in India. It was launched by a Soviet Kosmos-3M rocket from a Kapustin Yar. The spacecraft was quasispherical in shape containing 26 sides and contained three experiments for the measurement of cosmic X-rays, solar neutrons, and Gamma rays, and an ionospheric electron trap along with a UV sensor. The spacecraft weighed 360 kg, used solar panels on 24 sides to provide 46 Watts of power, used a passive thermal control system, contained batteries, and a spin-up gas jet system to provide a spin rate of not more than 90 rpm. There was a set of altitude sensors comprised of a triaxial magnetometer, a digital elevation solar sensor, and four azimuth solar sensors. The data system included a tape recorder at 256 b/s with playback at 10 times that rate. The PCM-FM-PM telemetry system operated at 137.44 MHz. The necessary ground telemetry and telecommand stations were established at Shar Centre in Sriharikota, Andhra Pradesh.